Wishing you and yours a wonderful day full of blessings! Today I'm continuing the Christmas decorating "tour" of my home! I bought this lovely tassel from Nester at Nesting Place, and I heart it SOOOO much!! This little Santa's glittered self is perfect with his soft colors and ribbons and trims! Here's our "family room tree". Yup, I'm having to specify, cause I've got several trees which are all decorated differently. And I also change things up every couple of years. Maybe I'll do a post on different Christmas trees I've had over the years! This year since I made a garland for the mantle (see yest. post! ), I just did a simple tree in this room to match. It's a fake tree (soooo much easier in my opinion than real -- burn a pine scented candle! ), and I just stuck in more fake greenery like I used in the garland, a mossy green ribbon that I already had, silver tiny jingle bell garland from Michael's, and silver glitter snowflake ornaments from Target (4 for $.99!). The tray on our ottoman with Christmas books, more vintage ornaments, my fav Home Sweet Home Candle, an angel and new cloche from Michaels. So there ya go! Hope you enjoyed seeing more pictures :)!! Some of you on the comments yesterday said that you were glad to see I was "keepin' it real" with showing my cord and other things :). Ready for more keeping it real moments?? My "tree skirt" is actually a lace curtain panel! And I just threw it down there for the photo yest. I was too lazy to get down on my belly and wrap it all the way around the tree! And it's still exactly like that today! The ribbon on the tree wasn't long enough to wrap around it. In fact it's not all one piece! I just tucked it around the front and sides. Your home can look lovely on a small budget. "Fake" it till you make it!!! Welcome to my mantle! It's all dressed up for Christmas! I was super inspired by the Nester's garland tutorial, and here's my version! I began with 2 el-cheapo 9ft. garlands from Walmart ($4 each). I laid them one on top of the other and intertwined some of the "branches" every couple of feet. This was the main part of my garland. Then I added in other greenery that I already had (I cut up fake stuff and stuck it in there!) to fill it out. Add white lights, more greenery, green berries, pinecones from the yard, and leftover ribbon, and you get a gorgeous-looks more expensive than $8-fabulous-Christmas garland!! I took these pics on 2 different days, so you'll notice some subtle changes :). I LOVE these pretty "mercury glass" trees from Michael's! On sale right now, girls!! I added a few of my vintage ornaments to the mantle as well! Ok, here's with the bow added :) It matches the ribbon on our family room tree! And it fills out the ends of the garland. In case you were wondering, I used those 3m Command hooks on top of the mantle to hold it up! Wind a "branch" around it, and you're good to go! Easy-peasy (and it's held for days so far!). I had originally had a silver Santa plate in the center. It looked good, but even though I collect Santa's, I didn't want anyone to think that it looked like we were honoring Santa as the focus of the season! So the Santa plate got moved to a side table, and I'm planning to get something else for the center. Maybe paperwhites? I just love how this project turned out! Thanks again, Nester, for the inspiration! I'll show you all a bit more of my Christmas decorating tomm.!! Also, I'm so excited to be one of the Saucy Blogs of the Week over at Secrets In The Sauce (SITS)!!! Thanks you gals :) Woot, woot!! I just love our neighbors! We live on a block with some really great people! My children play with their children/grandchildren (there are actually 4 sets of parent/grandparent who actually either live in the same home or across the street/next door to one another! So cool! ), and hubby and I talk with the adults on a very regular basis. It helps that we all moved here close to the same time from up north, and that the weather is just so stinkin' fabulous here for most of the year! I get excited about my neighbors! Probably because I never had neighbors growing up in the country. I've loved every neighborhood we've had (3), which has run the gamut from us being the only non-retirees on the block to having a full mixture of elderly and little ones all having fun at a block party!! Neighbors can give a hug and a meal after the birth of a new baby, or the loss of a loved one. They can babysit when you need to run to the store, or give advice on growing the greenest grass. They'll give a plate of cookies just to be nice. Impromtu pitch-in's when no mom feels like cooking dinner are the most fun! I like having neighbors!! So, this year our family is going to tell our neighbors how THANKFUL we are! 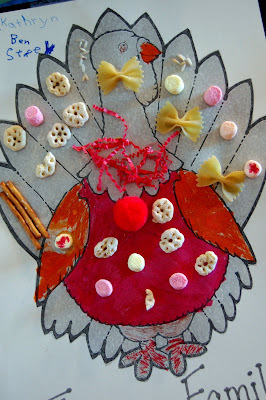 The kids will be making cards with me today (handprint turkeys! ), that say "We are Thankful....for neighbors like you!" This Thanksgiving, think about sending an "I'm Thankful for YOU!" card to someone!! It'll make their day! By the way, dear friends, I'm VERY THANKFUL for YOU!! Yay!!! I actually won something! :) Miss Ruthann from the most divinely lovely blog ever Warm Pie, Happy Home had a blogiversary giveaway, and out of 442 entries, I WON!!! Thank You so much, Ruthann, I LOOOOVE everything!! Ruthann was SO generous in this giveaway, and I feel so blessed! When I opened my package yesterday, I gasped. Okay, maybe I squealed and did a little happy dance! :) She had everything wrapped so cute in red and white polka-dots! The gifts were almost too pretty to open, but I couldn't contain my excitement for long!! I won the most darling apron EVER, a string of pearls "to remind you how precious you are", the most amazing smelling Evening Mocha scented candle, and 4 lovely books (some are co-authored by Ruthann! and she actually signed them for me!) that I can't wait to dive into! Thanks so much, Ruthann! You're so sweet!! If you haven't read and been blessed by Warm Pie, Happy Home yet, Go & check it out!! Turkey and Tinsel and Time-Outs, Oh My! I love doing little easy crafty things with my girls, and they made the paper above at our church class 's Fall Feast (a yummy potluck) this weekend. It now has a spot of honor on the fridge! I hope to make some Happy Thanksgiving cards with them this week to mail to family--I'll show pics of those when we make them! And the Christmas thing already?? Well, I normally don't get started decorating anywhere close to this early in the season! But since we trade off every year which holiday is spent at which family, and more often than not we aren't home for Thanksgiving or Christmas, last year we decided to decorate for Christmas right before we left for Thanksgiving holiday. Follow me so far? :) It made for such a stress free, enjoyable December! So, this year I'm getting a bit earlier start and just taking my time with it...even more stress free!! The above pics are things I have hanging on one of my trees :)!!! 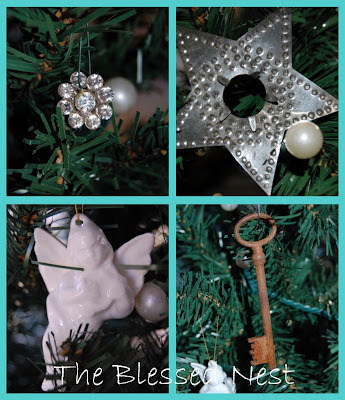 I have several, all of them decorated differently...this will give you a little preview! I decided that over the next several weeks, I'm also going to be giving LOTS of time-outs. Yup, you heard me! But not to my children (although with them home right now from their year-round school on track out, that remains to be seen! )....to me, myself, and I! I need a time-out every now and then to BREATHE, ENJOY, and RELAX!!! I think I'll take one later today with some hot cocoa and a book -- Yum! THANK YOU to everyone who left a comment about my sunroom decorating!!!!! The advice you all gave was amazing, and very much appreciated! I love having so many great decorating friends :). You're going to have to wait and see what I end up doing! I'll have pics for you after Thanksgiving of the end result!!! So, what are you waiting for?! Give yourself a TIME-OUT today!! What will you do during your time-out???!! Ok, chickadees! I need some decorating advise!! 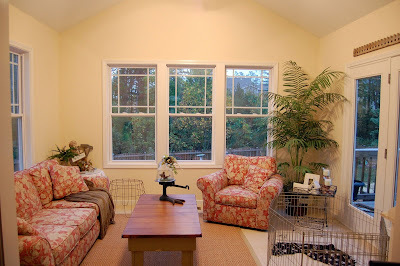 Remember this post here about making over my sunroom?! It's time to get started! 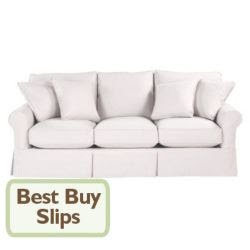 I shared with you that I've chosen white duck slipcovers from Ballard Designs for my Christmas gift (which thanks to Santa coming early for my side of the family this year, we'll be getting Thanksgiving weekend! :). 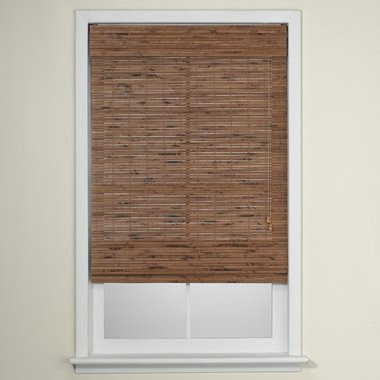 And I've settled on bamboo roman blinds/shades from Bed Bath Beyond for the windows. Would you recommend that I paint the walls or leave them as is??? If I paint them, I would use a very soft shade of sagey green. I really like the current paint color...it's the same as the rest of my living spaces (I have an open floor plan). However, it's the same as the rest of my spaces! I want to enhance the view of gardens and natural green space/wooded wetlands and woods. There is a very good chance we'll be moving within the next year. Yes, again. Maybe I'll get into that in a later post. But for now, I would like your advise as to whether I should paint a neutral "color", or leave the neutral color it is now for a faster sale?! I would be competing with a lot of lovely, brand new homes in the area, and even though we've sold our homes VERY quickly before I need to step up my game on this one! So, don't be shy, tell me what YOU would do! Ahh, the 5 senses of the autumn season are among my favorites of the year! On this Creating A Welcoming Home Thursday, let's focus on a few little things to enhance our family's enjoyment of this month of Thankfulness! Sight -- Switching just a few things around from the "Boo" objects of October to items of fall bounty will do the trick! Leave pumpkins and gourds, scatter fall leaves found on a family walk, and place bundles of wheat or branches on the mantle or table. Light the 1st fire of the season! Add some of the accent colors found in nature: reds, oranges, browns, golds...it'll make everyone feel warm and festive! Do a family craft time and have everyone write down something they're thankful for on a paper leaf...add to a pretty branch placed in a vase for a table display/centerpiece, then add the leaves to your scrapbook later!! Smell -- Light a lovely smelling candle (I'm just a wee bit partial to Yankee's Home Sweet Home scent! ), bake an apple or spice cake, and air out the house on a day that's a little warmer for some fresh, crisp fall air before the house gets shut tight for winter! Sound -- The sound of a crackling fire, crunchy leaves during a walk, and prayers before a family meal are all blessings! Take time to enjoy each sound during this season, and be Thankful for the little things! Touch -- Place a cozy blanket or quilt on the beds and one by the couch for snuggling on chilly evenings. Use fabric napkins in a fall color for meals...they are sturdy, pretty, washable, and less wasteful than paper! Pull out the fall/winter clothes and place away the summery things...a warm sweater is wonderful! Give lots and lots and lots of hugs to family and friends this Thanksgiving!!! Touch someone's heart by giving a donation to a local food pantry, coat drive, or shelter. Let's focus on the simple things this November, and be THANKFUL for all of the blessings in our lives!!! How are you going to enjoy this season to be THANKFUL??? I hope you don't mind seeing a few more pictures of my girls from when we were in MI! They had so much fun raking up all of the leaves and then jumping exuberantly in the big pile!! This is the kind of thing I loved doing myself as a kid, and we try to catch a photo memory or 2 each year of our girls doing the same thing! Have a wonderful day today, and take some time to enjoy the sights, sounds, smells, tastes, and touches of this Autumn Season! I think I'm going to make myself a cup of tea now!! !